With the summer solstice behind us and months ahead of soaking up the summer sun, we can’t help but have favorite summer destinations on the brain. There’s no question that when it comes to exclusive summer escapes, the Hamptons top the list. But, if you’re like us, no matter how gorgeous the outdoors, the beauty inside is a major factor in whether we love a vacation destination. In Out East: Houses and Gardens of the Hamptons, Jennifer Ash Rudick brilliantly displays some of the Hamptons’ most exquisite homes. The styles of homes in the Hamptons are as varied as the people who flee to them each summer. A beachfront setting and a pretty pool are icing on the cake and complete the enviable summer spaces. With homes this beautiful, we can imagine that some of these homeowners might decide to remain all year long. Do you have a beach escape planned this summer? Where is your favorite sandy getaway? Thanks so much for stopping by Design Chic today. We hope you have a fabulous week! Thanks to Shelley from Calypso in the Country for this beautiful review! “If you aren’t already a fan of southern fiction, this will be the book to get you hooked! 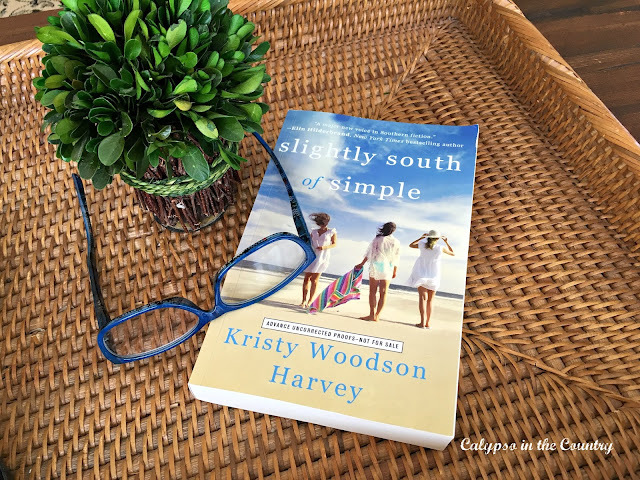 Kristy Woodson Harvey has done it again with her beautifully written latest novel, Slightly South of Simple…[H]eart-warming is actually the best word to describe this book. Kristy has a way of making you fall in love with her characters. If you have sisters, you will appreciate the interactions between the sisters in the book. Seriously, some of the comments between them were just priceless. I love that they are all strong women yet with quirks like all of us. I see nothing wrong with a little germ-phobia and aversion to GMO foods, but hey that’s just me! Yards of glass, something gorgeous right beyond… A room with a view, of course!